So, a bard stopped on by our headquarters here at HalloweenCostumes.com, and we had the opportunity to listen to him tell quite the tale. He told us about a fabled knight who lived in a keep far away on a remote hillside. This knight was well-trained, and well-equipped, and when the kingdom was in despair, he was the one who showed up to save the day. And, oh yeah, he dressed in all black. He was called the Black Knight! We were instantly hooked on the story, be it a tall tale or not. And, we knew right away that we were going to need a stunning homage to this Black Knight of lore. 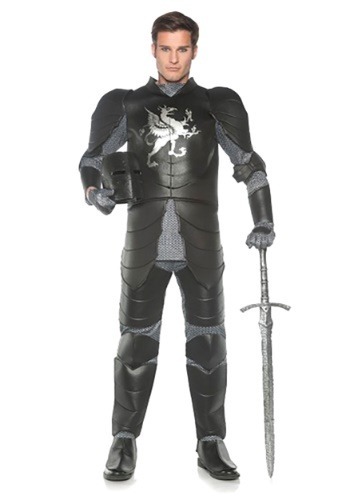 So, lo and behold, we're proud to present this Men's Plus Size Black Knight Costume, ready for you! With the stunning style of armor, in a bold black twist and sporting a silver dragon on the front, you're going to be up for all the medieval action you can handle. So, go on, suit up. And let's get to swinging the sword! This Men's Plus Size Black Knight Costume is styled to look like an armor suit worn over chain mail, but it's a simple costume top and bottom combination. Foam armor pieces are attached to the suit, and it's even got a slick silver dragon on the front, perhaps to show off that you know a thing or two about dargon-slaying. Suit up with this costume, and we're sure you'll be the most revered knight in your kingdom. Don't feel unease if you're not sure you're up for the task of knightdom, we're sure you've got what it takes. With an armor set like this, we'd say you're going to be nigh unstoppable! Er, for partying that is, we're not quite ready to vouch for your battlefield prowess.